Boxing 360 announced today that it has signed Philadelphia heavyweight prospect Joey Dawejko (5-0, 2 KOs) to an exclusive promotional contract. The 21-year-old Polish-American fighter is scheduled to make his Boxing 360 debut January 13 at home in Philadelphia against an opponent to be determined. "He's a catch," Boxing 360 founder and CEO Mario Yagobi said about signing Dawejko. "He's powerful, very poised for his young age, with an impressive amateur background from 105 pounds to super heavyweight. He's 5-10, weighs 235 pounds, and is powerful with either hand. He throws punches from different angles and when he hits, his opponent really feels it. Big heavyweights feel awkward fighting Joey because he's short and stocky. We believe that, in time, Joey will be a cruiserweight, where he'll be even more powerful fighting in that division. We're excited to be working with Joey and look for big things from him." Dawejko captured 14 U.S. amateur championships, highlighted by him becoming the youngest ever to win the Eastern Olympic Trials at the age of 16, as well as a gold medal performance at the 2008 World Youth Championships in Mexico. 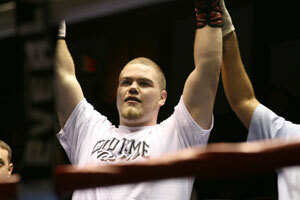 "I signed with Boxing 360 because I have a lot of confidence in Mario," Dawejko explained. "I feel it's the right choice because Mario can do a lot for my career. I think moving to cruiserweight is a good plan. I can easily make that weight. I'd like to win a couple of titles there and then go back up to heavyweight. My greatest attribute is my defense; I don't like to get hit but I really love hitting my opponent." In his last action this September, Joey took a fight on only two days notice against previously undefeated John Lennox (6-0), who Dawejko stopped in the opening round.